The three remaining members of Take That Gary, Mark and Howard put on an incredible two hour set from the O2 Arena in London. 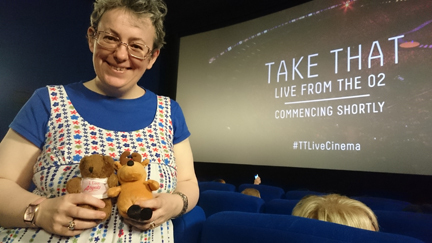 As it was our first ever Take That concert my husband and I didn’t quite know what to expect, as we took our seats at a local cinema surrounded by obvious die-hard fans. Although we only knew a handful of songs performed by the group we were sucked into an amazingly joyful musical experience, and came out with huge grins on our faces and our hearts gladdened in some way. I’ve been to several concerts and this one ranks as one of the best seen, so well done Take That and thank you for entertaining us so beautifully. As instructed we took our seats around 8pm for the scheduled 8.20pm start, although there possibly may have been a warm-up act just finishing, as the audience was let into the auditorium. For twenty minutes before the group appeared on stage at 8.40pm there was some odd action going on around the stage, bicycles, a man running inside a wheel and raincoat clad walkers! There may have been some significance to it all perhaps related to album themes or such like, but to Take That novices it went over our heads I’m afraid. It was enough to give us a sense of the atmosphere from London and to realise the view seen would be like sitting on stage with the group. We saw the guys preparing to get on stage and then to a huge cheer from everyone they emerged onto the concert platform. From that point on it was two hours of none stop action, dance, brilliant harmonics, musical genius and sheer showmanship. Absolutely fantastic and a complete surprise! When Take That were first around both my husband and I knew their sound because it was everywhere in the early nineties. They were number one in the charts with Everything Changes the day we married on April 16th 1994. Both of us would say we didn’t dislike them but we weren’t a particularly big fan either. Then when they reformed and released Patience I suddenly sat up and took notice. Until then I hadn’t realised just how good Gary Barlow’s voice was, so I paid a bit more attention to their new stuff. During the concert I recognised five of their newer songs, Greatest Day, Patience, Rule the World, Shine and The Flood. It was distinctly noticeable with The Flood that the group was a trio now, because Robbie Williams had joined his four former band-members to release The Flood for the charts. Although the three on stage did a nice job on the vocals neither Mark or Howard had a strong enough voice to fill in Robbie’s shoes. But it was the only time during the whole show I was aware of only three voices, as the five oldest songs were performed with aplomb with dance moves to match. The die-hard fans around us matched the guys with synchronised moves as Relight My Fire, Never Forget, Pray and Could It Ne Magic rang out. Many of the songs performed came from the group’s latest album III with a sprinkling of lesser known ones from various other albums. We were on the internet over the weekend trying to identify them and largely succeeded I’m pleased to say. From The Circus album we particularly enjoyed The Garden and Up All Night. I played both of these in my hospital radio show a few days after the concert. The Garden is simply beautiful with lyrics that highlight the maturity of the band and Up All Night is a quirky happy song with a country-and-western vibe to it. My husband remarked “the key-changes in this are remarkable. God they are good musicians”. For another song the comment was “the harmonics they are singing are incredible”. Praise indeed from a man who can be hard to please from a musical perspective. Affirmation from their Progress album had connotations of electro-pop music from Kraftwerk and the clever use of the ELO intro going into Shine didn’t go unnoticed either. But much of the unexpected joy came from the III album songs which were completely unknown to us. Catchy tunes that just drew you in, where you couldn’t help yourself tap the toes drum the fingers and bop the head. We just smiled at these and muttered “downloads and album buys a must”. Stand out songs performed included These Days, Let In The Sun, Portrait, I Like It and Get Ready For It. I was also particularly struck by a lovely ballad sung by Gary which I’ve worked out could be Flaws. Gary dressed in black sang from the mid-point of the stage whilst the others in black skin-tight trousers and white vest danced on the flanks. Mark and Howard’s contemporary dance with the faintest whiff of ballet in places complemented the plaintive vocals of Gary simply and beautifully. I know the guys in the past did choreographed moves but this was a more mature and raw performance, highlighting again the growth of the group from boys to men. Their vocals, musical awareness and stage presence were a joy to behold. An abiding memory for me will be Rule the World which closed the main part of the show (followed by encore Shine and Never Forget). The stage was bathed in light but the main arena was in darkness except for hundreds of small lights waved in unison from audience members. As I looked around the scene was replicated in the cinema as those wonderful lyrics enveloped me. It was a beautiful moment I will cherish.